"At the height of the real estate frenzy, every man in camp who could handle a saw or hammer was kept in constant employment. Even young boys got a dollar a night for holding lanterns for carpenters so they could see to drive mails." So begins Silvia Pettem's account of the Gold Miner Hotel in her 1998 Inn and Around Nederland. In December, 1897 the Randall brothers, I. J. and Jas. M, saw an opportunity in the hotel business and decided to build the Gold Miner Hotel. They and their partner Alice A. Smith bought the lot at 6th Street and Klondyke Avenue in the newly platted Town of Eldora for fifty dollars. It was winter mind you with winds approaching 100 mph but the carpenter, Olaf J. Olsen a Norwegian, milled the logs on site and "carefully dove-tailed (them) together." In two months the Hotel was complete. "In order to have a more refined appearance toward the street, the entire front of the building was covered with clapboard siding and painted white." The 30-room hotel was opened in February, 1898 by its manager Mrs. Mena Given. A Denver Times reporter noted, that "her only fault...is her great tender-heartedness and helping on some struggling fellow creature." The dove tailed log joints and white clapboard are just as visible today as they were the day the Hotel opened. The sign on the porch roof blew off in the first few years but it has been restored from materials on site and appears today as it did then. The Hotel is just five sleeping rooms now, but they are a lot bigger than those used in 1898. But with the exception of the Social Room added by the Community in 1934 The Hotel's appearance has not changed. In March, 1898 the incorporation meeting of the Town of Eldora was held at the Gold Miner. The first and only order of business was to issue a saloon license to The Hotel and after that agenda item the meeting adjourned probably to put the new license to use. The real estate boom had run its course by 1900 and in 1904 The Hotel was sold for next to nothing. The miners were gone, too but the Community began changing into one to which residents of Texas, Nebraska, Iowa, Missouri, and Kansas came to escape the summer heat. 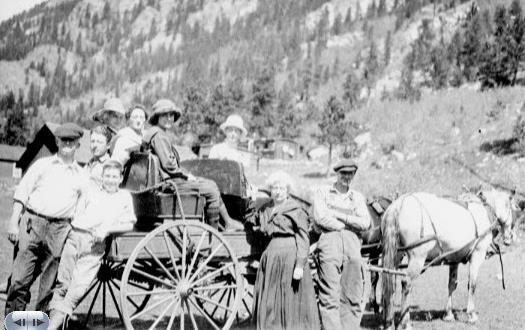 To read more about Eldora people and happenings try Silvia Pettem's two books Inn and Around Nederland and Excursions from The Peak to Peak both available at the Goldminer Hotel. Subscribe to our Blog for more people and more stories. Attend a Hotel sponsored "history night" to explore tales like this in a lot greater detail. Stay a night or two and become one of these Inhabitants.